Take the Toronto streets. Stepping out with my camera slung over my shoulder this morning, the air was warm, perfect for a denim jacket, and the sun was pouring through the trees on my street in thinly veiled rays. Yonge Street was quiet, calm, with a few pedestrians making their way to different Sunday morning commitments. A trio of pugs huffed their way past on a set of leashes, each of them chuffing quick bursts of air from peeled back lips, each of them wearing different, brightly coloured jackets. On Bathurst, a few stray shouts squeezed through the State Champs in my headphones. 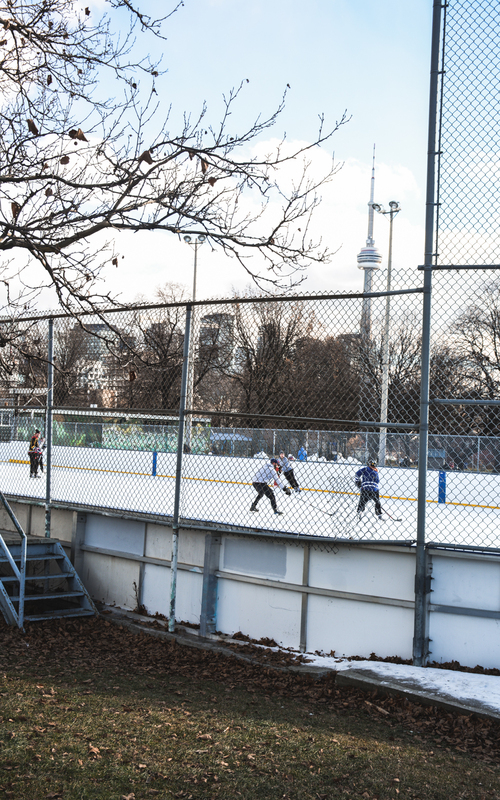 I crossed the street where a pick-up hockey game was happening on the rink in Alexandra Park. 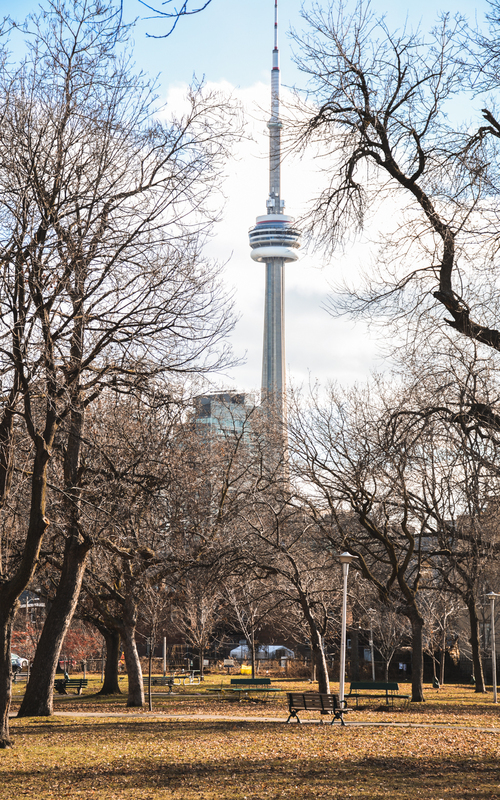 The CN Tower rose tall, bathed in golden light in the background. I smiled, and for a few minutes, listened to shouts of encouragement, the slapping of sticks and the carving of blades on ice, leaning against the chainlink fence around the rink. The Toronto streets seem bright, warm and slightly nostalgic, even in my minds eye now. However, it leaves out the scummy underside of the trip from Bloor Street, south to Front Street. It leaves out the urine stink reaching out from the alleyways. It leaves out the human detritus of garbage, food scraps and forgotten hunks of clothing and packaging lining the gutters, ankle deep in some places. It leaves out the homeless man, lugging a cracked and stained plastic cup and a dime sized red boil hanging under his nose, up and down the subway moaning for chaaaaaaaaaange. And it leaves out the pigeons picking happily at a fresh slick of vomit on the sidewalk. New Years Eve is kind of like this. Not like a fresh vomit slick on the sidewalk…though I’m sure there are a few of those created that evening, but I’m talking about two sides. There’s the flashy parties, mostly empty of any real substance, and there’s the real moments, shared at midnight with someone you care about. There’s the new year’s resolutions. Goals set in moments of clear optimism, then forgotten by many only weeks later. For me, I’m a fan of resolutions, but not just at new year’s. I’m constantly thinking (and probably stressing myself into grey hair or an ulcer) about ways to improve, work harder and more efficiently. However, I do think new year’s eve is a solid reminder, and great timing, to do such things as take stock, and plan ahead for a fresh year. I did that very thing Saturday evening. At the coffee table in my living room, my back aching behind me, the Leafs beating Vancouver 5-0 on the TV in front of me, I hit the yellow legal pad with a number of things I want to accomplish, improve and strive for in the new year. There were things both professional and personal, things both easy and slightly more complicated. The beginning of the new year is a time to think big. A number of the items on that list, scribbled, scrawled and highlighted into a crumpled mosaic on the table in front of me, coagulate into a single theme. I want to start concentrating more time on the things that I want to do. The things I love and I’m passionate about. I want to start prioritizing my life outside of journalism. The last four months, launching The Pointer, and pouring all of my grit and energy into getting the stories to a quality our new media company demands, has taken a lot out of me, and I haven’t had a lot of time for other things. Photography was one of those things. So, more time taking pictures is on the list, but not written like that. “More time taking pictures” is too broad, too easy to get out of, like a piece of yarn binding you to the commitment instead of handcuffs. For 2019 I want to make one image a week that I’m happy with. One image. That doesn’t seem too hard right? With a city like Toronto sprawling out around my apartment, I’m essentially in the middle of a labyrinth with potential photographic gems hidden all around every corner. To start though, I’m keeping it simple, I’m starting with those gems that are hidden in plain sight. Any Google search of top photo spots in Toronto will inevitably release hoards of posts about the most Insta-worthy spots in TO. Well, I’m working on a list of my own, and many of the locations on these poorly-written slivers of the Internet are definitely worthy of checking out with my camera. One such spot is the Bathurst Street Bridge. With M on nights this week, I snuck quietly out of the apartment around 11 a.m. while she slept. I hopped on the Yonge subway line and transferred over on the Bloor Line to head toward Bathurst. I easily could have knocked off a much larger portion of the trip using the subway, but I wanted the exercise (another thing on the yellow legal pad, always enjoy a good two-for-one). 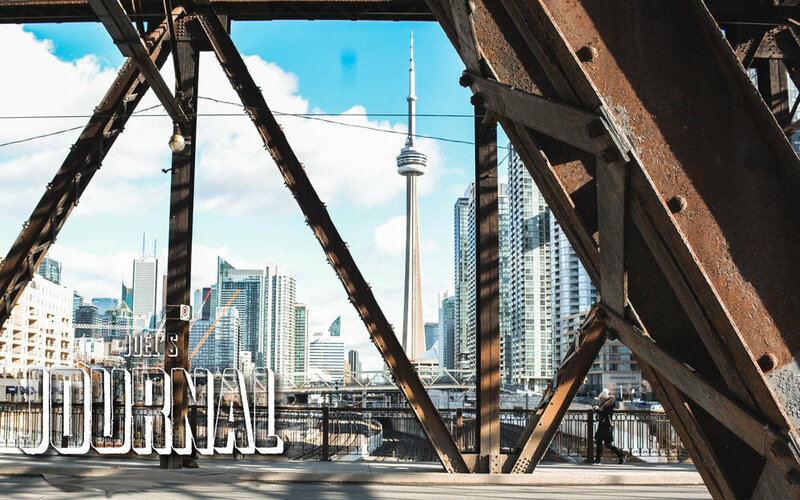 It was about a 30 minute walk from Bloor Street down to the Bathurst Street Bridge over the railway tracks. It’s a very popular spot, and I knew what to expect in terms of the view, but luckily, the place was empty of other photographers, which I was happy about. The lack of trains I was not so happy about. The image in my head had the city sprawling skyward in the background, with a train whizzing over the tracks in the foreground. A VIA train was heading west just as I arrived, and I was able to snap a few images before it was too far gone. I snapped a few more, moving to the other side of the bridge to get the view through the old and rusted beams of the bridge, and tried to get some movement in the image with the passing cars and pedestrians. The trains still didn’t come though. 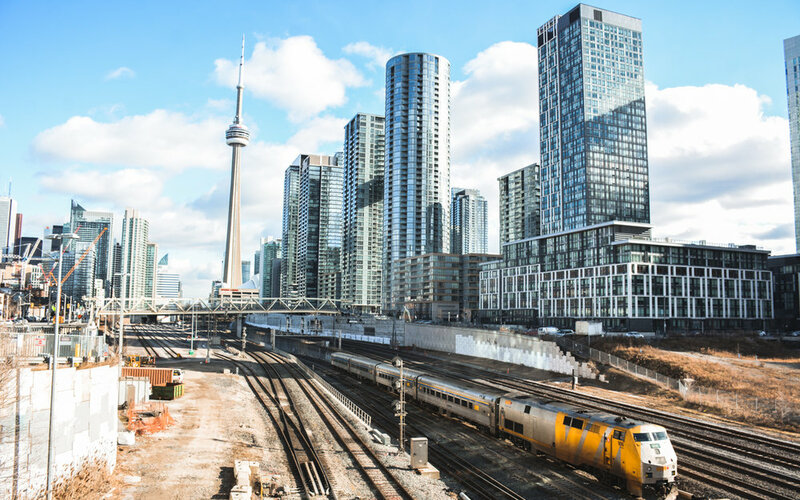 I moved down toward Front Street, meaning to cross Bathurst and head back to the other side of the bridge (it was too busy to cross in the middle), and just as I left a GO train came whizzing by. I pulled up my hood as the wind began to pick up and stomped by Blundstones on the pavement to try and keep my feet warm. Another train finally did go by, but it was only a tiny, four car machine and was barely worthy of a shot. I was looking for the long length of a VIA or GO to make the image I really wanted. I made a couple more images from the pedestrian bridge (more east and closer to the CN Tower than Bathurst Street), and then headed back for the subway, I admit, feeling slightly defeated. I dropped into my seat on the mostly empty subway car and began to thumb through the images on my camera. Many of the shots I’d made were decent. There were a couple interesting ones with the beams of the bridge dividing the frame, and the view made it hard not to be good image with the CN tower and the hulking glass goliaths that are the surrounding condos. They just weren’t the image I had in mind. It was near the beginning of the my day’s images that I stopped, surprised. The first VIA train had moved by so quickly, and I’d snapped the images so hastily, that I’d barely had a chance to plan and line up the shot. Yet, as I looked at the small screen, the homeless man limping past with his chaaaaaaaaange mantra and dragging feet, I thought the image was actually pretty good. Looking at it on my small screen, I realized that, yes, yes, I can put the stamp on this one. It’s not exactly what I had in mind. I was hoping to slow down my shutter speed and have the train be slightly blurry, giving the shot a bit more movement, but for today, this one will do. My Moleskine planner is slotted off with days throughout the year for scheduled shooting just like this. I’m sure that some of them will fall through, life happens, things come up, but putting in the effort is the first step. Today was the first of many steps. Well, perhaps it was two steps, I did meet my 10,000 step goal (I hope to do that twice a week). Oh, and I plan to grow the audience on this website, which I can only do by posting new content. So, I guess you can say today was a three-step day.